On this beautiful winter day, I decided to take a hike into the deer woods. I hadn’t been there to check things out since I hunted last, over a month ago. This fall, loggers had been marking up the place getting prepared to harvest another section of acreage. It was time to check on their progress. The fresh dusting of snow would provide the opportunity to investigate any fresh tracks as well. Plus, I still have a scouting camera and deer stands in place that needed to be checked. I have about a mile hike until the last ridge above the swamp where my camera stands post at the beaver dam crossing. With limited time to get in and get out, this would be my main objective today. However, upon arrival at the trailhead, it was obvious that the loggers had begun their work. The popples that once walled off the parking area from the county road, now lay stacked in piles ready for shipment to the paper mill. I believe the rest of their work will be down the west trail, but I would be travelling the east trail today. I will have to check the rest of their progress on another date. Fresh deer tracks greeted me as I stepped foot out of my truck. Two sets. I followed their on and off trail meandering as I headed down the east trail. Before long, they turned south along the major trail that runs along the north-south ridge. As always, the north-south ridge deer trail entrance is being heavily used. Another hundred yards east and my trail turns south as it heads for the swamp. Another hundred yards and I encountered coyote tracks working against me along the trail. A sign that the wolf trapping had probably seen some success this fall. Wolves and coyotes do not exist well together. 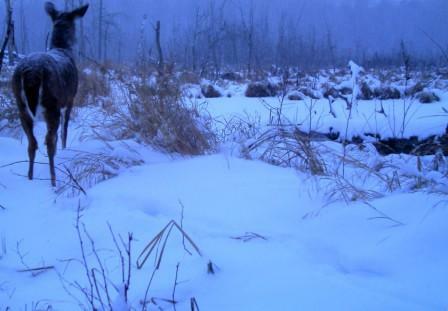 A wolf will go out of its way to kill a coyote, and even break off from a hunt to do so. The tracks entered the trail corridor from the west and broke off to the east; headed for the cedar swamp to the north, perhaps. Further down the trail, there were rabbit tracks, grouse tracks, small rodent tracks of some sort, and more deer tracks, but I had to keep moving if I was going to make it to the scouting camera and back to town in time for class. The boughs of the white pines in the depression below barbwire knob still held snow. The sun hadn’t reached them yet. There had been a lot of activity on the east-west deer trail on the ridge above the swamp, but very little at the beaver dam. The scouting camera’s batteries were dead, but it didn’t look like it had missed much recently. I replaced the batteries, changed the memory card, and reset the camera. I had no idea, at the time, how many images the camera captured before the batteries succumb to the cold, but from the looks of things I may need to relocate it up the ridge. But that would have to wait for another day because I needed to turn around and beat it on down the line to make it back for class in time. Tonight I checked what the scouting camera had seen before the batteries gave out. There were only four pictures: a spiker, a fork, a larger buck, and a doe all from December. The doe gave the best pose early one evening in late December on a vigilant crossing. Wild Turkey Hunting in 2008!